Fold your chosen piece of colored card in half to create your card. Draw the details of the animals with a fine-tipped marker, you could make little penguins, birds or any other critters of your choice. Voila! 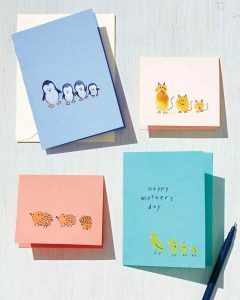 You have a personalized card for your Mom! Kids craft activity referred by Avian Kingdom, taken from iheartcraftythings.com.